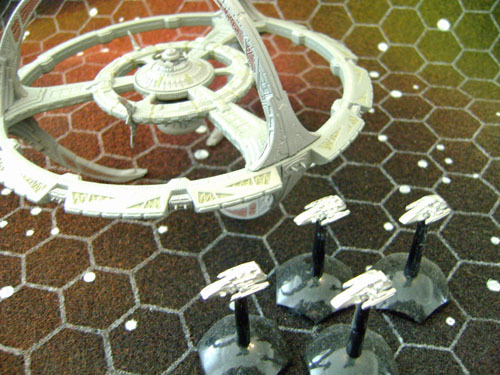 One of the races of my Fleet scale universe is Gerry Andersons “Space 1999” fleet. 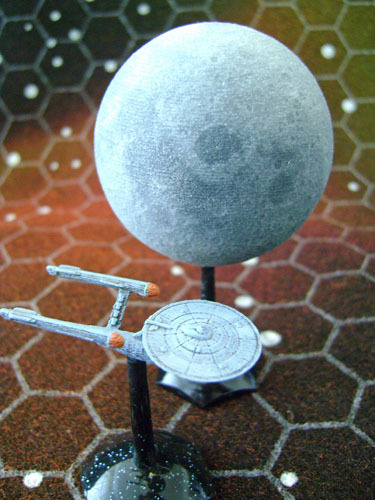 The eagles needed a base……I needed a Moon! 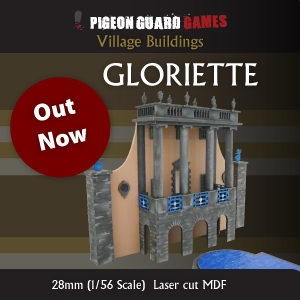 So instead of making one myself I opted to buy one from shapesways, prepainted in sandstone texture. 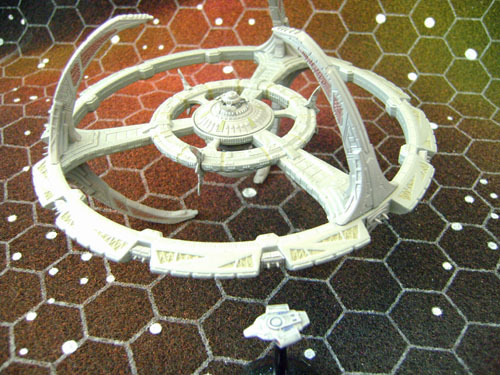 Here it is with a 1/7000 scale constitution class ship. 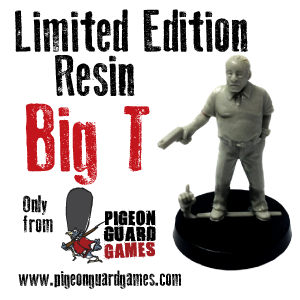 Leave a comment	| tags: Moonbase Alpha	| posted in Fleet Scale Sci Fi 1/7000 scale...ish! 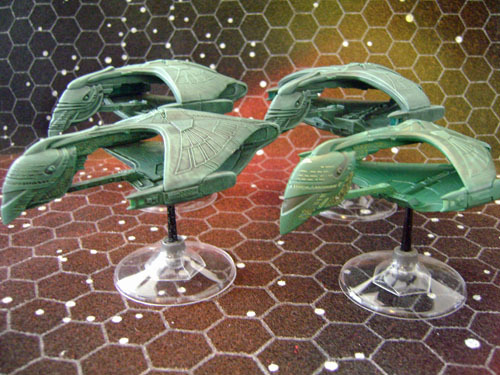 Romulan Fleet rebased and additional! 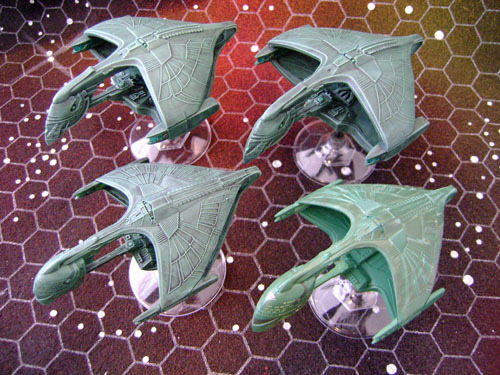 I took the opportunity to pick up another Romulan warbird from the Starship Collection range to boost their numbers. I also rebased all the ships so that they don’t keep falling over! The new warbird is prepainted and I haven’t yet got round to painting it to fit in with the rest of the fleet. The diecast version differs slightly from the Hallmark version enough for me to think about reclassifying the diecast version as a different class of ship. 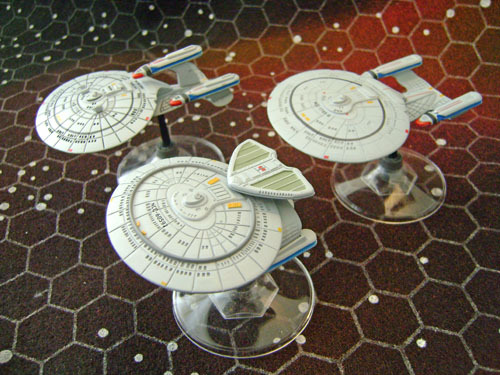 The 2 ships at bottom of picture are the Starship collection version, two at top are Hallmark Christmas tree decorations! 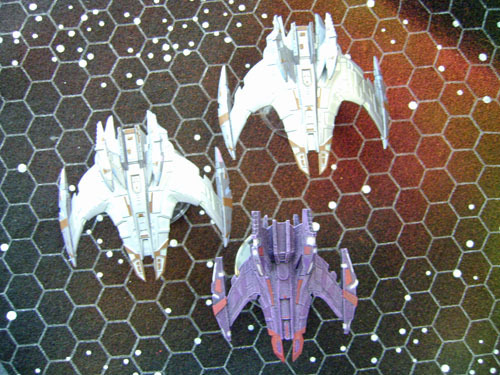 I had never really been happy with my tiny micro Machines DS9 being so small so always wanted a bigger version, one that was as near 1/7000 scale as I could get. 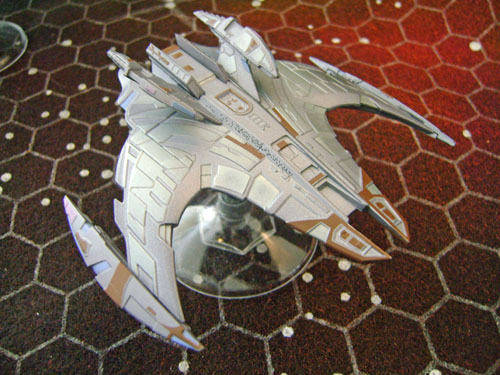 The Starship Collection version was a rare special edition, and I think it is now out of stock, so if you see one on ebay you might want to pick one up quick! A few Comparison shots for you to judge size. 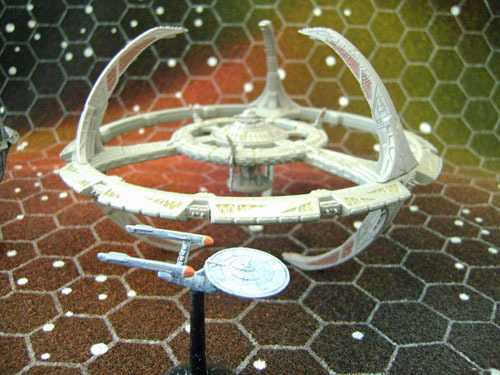 1/7000 TOS Enterprise with Micro machine DS9 alongside Starship collection version. Picked this up a while back, it’s prepainted which is total pants, so will have to re paint it. it came from the Star Wars magazine ship collection and is diecast. 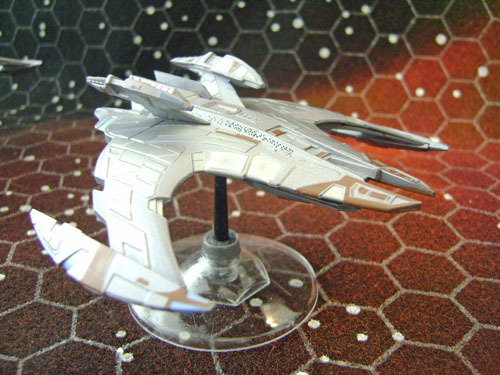 it’s a good size for fleet scale, and I have a lot of fighters to go with this ship!!! I already own a Battlecruiser from Ender’s range of ships but decided to pick up a couple of the Starship collection versions of this ship. Slightly larger than Enders 1/7000 scale version, So I will reclassify them as Battleships! Not many of the ships in the Starships Collection are useable for Fleetscale, (I don’t like massive differences in scale) but well worth picking up some if you see any on Ebay! 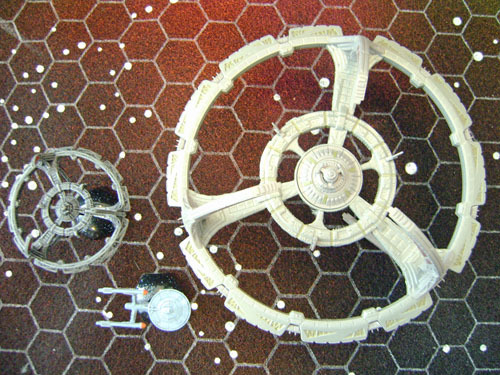 Rebasing was required of all my heavy and large ships. 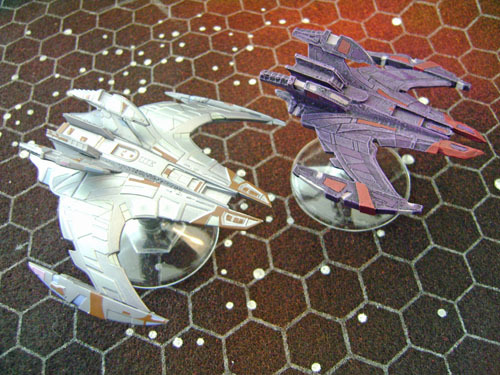 When I decided to move into the world of Fleet scale I opted for a hex mat so i could use Hex flight stands for all my ships. It was all going well until my ships started to get bigger. It started to get difficult finding the centre of gravity for the mounting post, however, the slightest of breezes would knock down the ship, more often than not breaking the post and requiring hole to be drilled out again. After doing this several times I knew it couldn’t go on. Something had to be done. The solution popped up when I was at a party where there were disposable wine glasses, the ones with the removable base! I collected up as many as I could (kitbash scavanger mode!) and thought about how I might use the part. 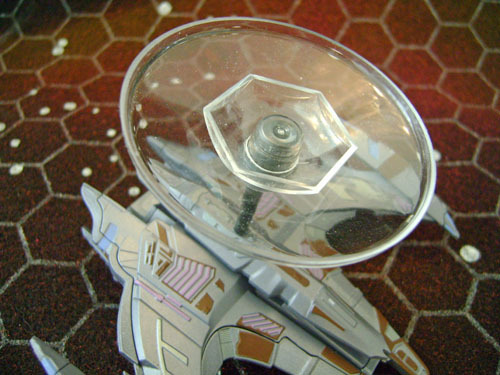 The plastic wine glass base was transparent, but the stem location point would need a bit of filling so that it could take the mounting post of the flight stand. I used grey pro create, but Green stuff would work well enough, whilst in an unset state i pushed in the mounting post to get a good locating lug hole. Sitting there looking at the base it was good, did the job but no hex. 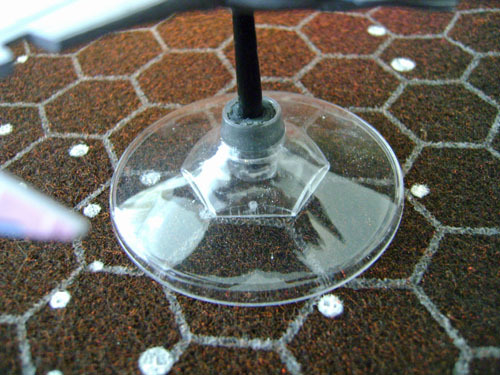 I had some clear plastic hex bases and decided there must be a way of getting them in the space under the wine glass base. 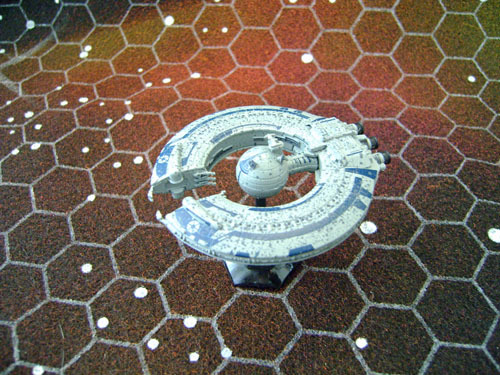 The result is a totally stable platform for big ships with an outline of a hex for easy movement on the mat. Job done!